Samsung Galaxy S8 Plus review | What Hi-Fi? The Galaxy S8+ is like an S7 Edge that went away for the summer holidays and hit puberty. It’s taller, slimmer, and with good looks guaranteed to turn heads at the water fountain. Or wherever else you take it out of your pocket. After the Galaxy Note 7 catastrophe last year, the Galaxy S8+ clearly has something to prove. 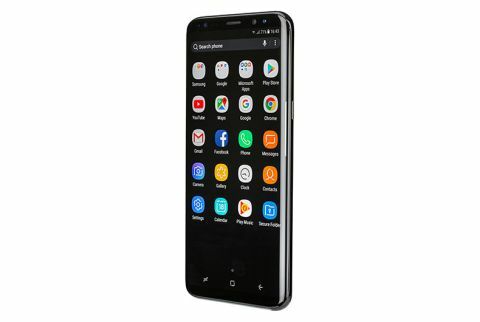 It has ended up with a bezel-busting display that fills the front of the phone, squeezing more screen space into your hand than any other Galaxy handset, without making it feel like you’re lugging an unwieldy monster around. Beyond the attention-grabbing screen, which curves around the sides of the phone and slots smoothly into the metal frame, the S8+ shows some clear design inspiration from the Galaxy S7 Edge. That includes the combination of aluminium and glass, which feels every bit as premium as last year, and the same subtle, smoothed down corners and edges so it always feels comfortable in your hand. It’s like holding a smooth pebble you find at the beach. You may not even want to add a case. It’s rated IP68 waterproof, meaning it can be submerged in 1.5m of water for 30 minutes. The headphone jack (yes, it has one), single speaker and reversible USB-C port are all waterproofed too, so there’s no need to mess around with fiddly rubber port covers. The microSD card slot makes a return, too, so you can boost the 64GB of built-in storage by up to another 256GB. The fingerprint-sensing home button, once a staple of Galaxy phones, has been replaced with a digital home button built directly into the display. The sensor has been shifted to the back, next to the camera module, which now sits completely flush to the phone. It’s not easy to reach on this Plus-sized model, unless you adjust your grip, but you might not need to use it at all – there’s iris scanning and facial recognition on the front. Both work pretty well, accurately detecting and unlocking the phone around 90 per cent of the time, even in pitch darkness. The digital home button works just like the Touch ID button on an iPhone 7 Plus, with haptic feedback vibrating to let you know you’ve pressed hard enough. It’s always visible, even when the screen is off, so you can find it straight away. It might not be the first phone to make the switch from traditional 16:9, but the Galaxy S8+ goes even further than the LG G6 with an 18.5:9 aspect ratio that stretches around the sides with curved glass. It’s narrower than a traditional smartphone screen, meaning you can hold all 6.2in comfortably – even if you can’t quite reach the top without stretching. It has an extended pixel count to match the stretched dimensions, too: 2960 x 1440. You’d have to pick Sony’s 4K-packing Xperia XZ Premium to find a higher resolution phone. It renders at Full HD out of the box, to save on battery power, but you can force it to use all those pixels through the Settings screen. Samsung already had one of the best smartphone screens with the Galaxy S7 Edge, but the S8+ is even better. Colours are richly textured, blacks are as deep as you’ll find on a phone, and images and text both look impressively sharp. Contrast is strong, thanks to the AMOLED panel, adding plenty of detail to darker scenes and really letting bright whites punch through the darkness. Brightness is equally impressive, with the ability to crank things up when you step outside so you can still clearly see what’s on screen. Samsung’s colour modes make their reappearance, with Basic still providing the most natural balance. AMOLED cinema and AMOLED photo have brighter whites, but colours become overly vibrant and unrealistic – even if the warmer tone seen in the Basic mode can be a little distracting when scrolling through websites. The S8+ is also the first phone with Mobile HDR Premium certification. It will play HDR content from both Netflix and Amazon Video, as soon as the process of streaming HDR videos to smartphones is standardised. Having seen demos of HDR content, it really does make a difference, with a wider colour gamut and more nuanced gradation between dark and bright parts of a scene. Always-on display makes a return here, putting the basics like time, date and incoming notifications onscreen even when the phone is in standby. It drains less than one per cent battery per hour, and saves having to turn the phone on and off to check for important messages. You can set it to a schedule, too, so it doesn’t distract you when you’re trying to sleep at night. It might not have a headline-grabbing quad-DAC like the Korean version of LG's G6 but audio is one area that Samsung continues to improve on year after year – and the S8+ is no different. AKG has been brought onboard with the bundled pair of in-ear buds. They have a braided cable, which should withstand a bit more punishment than the usual plastic freebies you get with phones. They sound clear and detailed but emphasise the low frequencies a little too much. The top end could do with extra refinement - it highlights sibilance and is a little thin. Overall they're still better than most give-away buds. Trying the phone with a range of alternative headphones reveals a detailed and spacious-sounding performer with reasonably expressive dynamics. Apple's iPhone 7 Plus is still ahead when it comes to rhythmic drive and punch, though. With a decent set of cans plugged in, music is detailed across the board, with bass that doesn’t overwhelm and plenty of vocal clarity. Apple still has a slight edge for its full-bodied sound, though. The S8+ does support high-res audio, including DSD128 files. Add a microSD card and you’ll have plenty of space to build a hi-res music library. Going on specs alone, the Galaxy S8’s 12MP, f/1.7 aperture rear camera doesn’t look like much of a step up from the Galaxy S7. Both have incredibly quick dual-pixel autofocus, optical image stabilisation to keep things sharp, and an LED flash to save low-light snaps becoming grainy and unusable. But you shouldn’t judge the camera by its pixel count. There’s a lot more going on behind the scenes to make the S8 a real improvement over its predecessor. Multi-frame image processing now takes three photos for every press of the shutter button, stitching them together to improve the final image. Well-lit photos have noticeably less noise and more detail than the S7, and you aren’t left waiting around for the processing to finish. You can fire off shot after shot and the phone will always be ready. As we’ve come to expect from Samsung, colours are vibrant (a little overly so) and details are well defined, with great contrast but without overly aggressive sharpening. You’ll spot it if you zoom in, but it hardly detracts from the full photo. It does have a tendency to overexpose scenes in order to make them brighter, especially in low light. Purposely underexposing in manual mode can help rescue nighttime images that would otherwise be too blown out. While the iPhone 7 Plus takes fantastic low-light photos, it is a lot noisier than the S8+, even if Apple does have a slight edge when it comes to sharpness. Otherwise, the two phones are difficult to separate, with Apple taking the edge in some scenes but Samsung coming out on top in others. Samsung’s Camera app is even easier to use, with the most important controls, including HDR, available on the main screen. Swiping in from the side reveals modes like Panorama, Selective Focus (which blurs the backgrounds of portraits) and Pro mode, which gives you plenty of manual controls to choose from, including ISO, shutter speed and white balance. Video is available, all the way up to 4K resolution at 30fps. You can also shoot Full HD clips at 60fps, but if you want shake-free, electronically stabilised video, or to record in HDR, you’ll need to stick to 1080p30. There’s also slo-mo and hyper-lapse recording hidden in the menus. Samsung finally started listening to customer feedback on its divisive Android UI last year, and Touchwiz on the Galaxy S8+ is even more pared down and unobtrusive. It’s still there, of course, running over the top of Android 7.0 Nougat, but now you aren’t forced to follow the Samsung way of thinking. That includes swapping the Back and Recents keys, and removing the app drawer in favour of iPhone-style multiple home screens. There are still a few pre-installed Samsung apps, but they’re hidden away in their own folder, and you can always remove them to free up space on the phone for apps you’ll actually want to use. The AI-controlled Google Assistant has arrived with Android Nougat, but Samsung has also supplied an AI of its own – Bixby. It even gets a dedicated hardware button to launch it. Bixby can use the camera to detect objects, landmarks and locations to send transport or restaurant advice, or scan QR codes and barcodes to make your shopping go smoother. Eventually, you’ll be able to talk your way through Samsung’s apps (plus a few third party ones) to hunt for photos of a specific place or person, order an Uber, or send a text message without having to tap the screen. However, voice control won’t be arriving until later in the year, making Bixby something of a novelty right now. Samsung will have to work some serious overtime to catch up with the likes of Amazon’s Alexa before Bixby becomes a must-have addition to your phone. With Samsung’s own Exynos 8895 octa-core processor inside, the Galaxy S8+ is remarkably fast. There’s almost nothing this phone can’t handle, and that includes doubling as a desktop PC once you dock it into the optional DeX station accessory. Apps open almost instantly, loading times are reduced in games, and there are no stutters or stalls in any Android animations. Frame rates in games are consistently smooth, and swiping through home screens feels immediate and lag-free. 4GB of RAM helps keep up that pace, even when you’re multitasking – an impressive feat considering many rivals are switching to 6GB or even 8GB of memory. Battery life is the one area where things take a backward step. The S8+ has a 3500mAh cell, which is 100mAh less than the Galaxy S7 Edge. Samsung is playing things safe here, not wanting to push things too far after the battery chaos it experienced with the Galaxy Note 7. The good news is that the S8+ can still keep up with its long-life rivals. Regular users will easily get through the entire day on a single charge, and most power users probably can too. Over wi-fi on half brightness, an hour of Netflix video drained less than 10 per cent charge. The Samsung Galaxy S8+ is a refined design. The front-filling screen, stripped-back bezels and curved sides make it arguably the best-looking phone you can buy, and it has the internal hardware to keep it competitive. A camera that trades blows with the best Apple has to offer, a great screen, and enough power for any game or app you’d care to throw at it, means this is one seriously impressive handset. It’s not perfect, the sound could be better, but in almost all other respects, it's as good as Android gets right now.